Does Mobile drive Africa? Oh yes it does. With Mobile accounting for 80 percent of internet penetration in Africa, it has in fact leapfrogged the economies of different countries within the continent forward. Moving at the speed of light into the era of smartphones, the influx of low-cost smartphones into the region has further strengthened its title as the ‘Mobile continent of the world’. 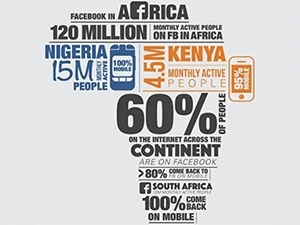 Last week, Facebook, one of the world’s biggest social network with an active monthly user base of 1.49 billion people, announced that as at June 2015, they were 120 million active users of their platform in Africa. Forbes reports that the statistics released confirms that 100 percent of its monthly users in Nigeria (15 million) and South Africa (12 million) are on mobile phones. Of Kenya’s 4.5 million monthly users, 95 percent are on mobile. With South Africa having 12 million daily users, Nigeria 7.1 million daily users and Kenya, 2.2 million daily users, Facebook credited the success of this milestone to the growth of mobile devices in the ecosystem as over 80% of these people login through their phones. This recent statistics, amongst many others, further goes to show that as a serious brand owner or manager in this age, the use of the internet and indeed social media cannot be left in the background. You either shape up or ship out. Imagine this! A plumbing company in the United Kingdom, LS Plumbing, created an infographic showing how plumbing begun and where it is now. If plumbing companies can be social media savvy, why not your business? Virtually any person, business or group can reap social capital with the right content no matter how tough that industry may seem.